Houses made of cylindered logs are getting more popular today, because wood – it is the unique natural material; it has a lot of good qualities, that differs it from other unnatural materials. Houses made of cylindered logs (instead of beams, panels or bricks) require minimal extra external or internal finishing. Such houses have an excellent look. Microclimate good influence the health of its roomers, who are living in the house made of cylindered logs. Centuries-old traditions of wood building, unique wonderful qualities of the wood, wide experience give us an opportunity to create projects of different complexity. 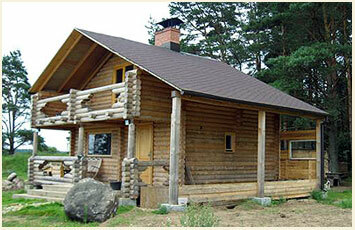 Houses and baths made of cylindered logs and build by company “VR Buve” – it is pride for its owners for many years. Houses made of cylindered logs are breathing; the warmth is kept longer than in houses made from other materials. The temperature changes very slowly in the house made of wood. The cylindered log keeps fresh air, warmth in winter and coolness in summer. In the wooden house you will be always satisfied with your rest, that’s way such houses are getting more popular among population. In our rush life, when new technologies become out of date before getting a certificat, when plastic, iron and concrete conquer market and new territories, the warmth and comfort of the house made of cylindered logs takes on special significance and value. People, who think about ecological compatibility, closeness to the nature, are scrupulous to personal health and to the health of their relatives, usually choose a wooden house. There is no glued connection in the materials of such houses; it means that the house is “breathing”. If somebody has slept in the wooden house knows the good feeling by awakening. For full regenerative sleep in such house you will need some hours less than in the house made of bricks. Houses made of cylindered logs have an excellent look both inside and outside, and do not require either external or internal finishing. You will be surprised, how it is easy and simple to assemble the house. One of the advantages is good price. For building we use cylindered pine with diameter 16,18, 20, 22, 24 cm; it is done on high-technology equipment. As heat insulation between logs we use material ISOVER, flax fiber . By building of the construction are used treenails, tacks, staples, anchors.